Pet humanization -- the push to provide our four-legged companions with human-quality products -- has given rise to an important type of pet owner: the premium pet product shopper, according to Packaged Facts. In force for several years now, the humanization trend has multiple facets. Foremost, it’s a natural expression of the “pets as family” trend, whereby pet owners treat their pets like children and are highly receptive to products similar to the ones they use for themselves, said George Puro, the analyst who wrote the report. In terms of retailers, PetSmart has embraced the humanization trend and there's no sign of it slowing down, he says. “ The chain sells energy bars from Purina, supplements from GNC, and now offers Pet Expressions dog grooming, which includes chalking and feathering your pet,” Puro says. Not coincidentally, many of the services and products entering the market today are directly reminiscent of human fare, no doubt appealing to the pet owner as much as the pet. Examples include veterinary procedures like chemotherapy, MRIs, and hip replacements; pet supplements like glucosamine and omega 3s; human-grade pet foods containing superfruits or touted as gluten free; designer pet supplies, including Bottega Veneta pet bowls and Simmons Beautyrest pet beds; and luxury services including boarding options more like hotel rooms. Packaged Facts has tracked the emergence of premium pet product shoppers and have confirmed the cohort’s behavior patterns going back several years. For example, the company’s February/March 2013 pet owner survey found that a resounding 70% of pet owners would be willing to spend extra to ensure the wellness of their pet. Premium pet product shopping is most common among higher-income households. U.S. households earning $70K or more account for 54% of the aggregate pet market expenditure, and Packaged Facts believes these consumers to be footing the lion’s share of the bill for premium pet products and services. Generally speaking, better-off pet owners are also more likely to have been less affected by economic doldrums and are recovering more quickly. The takeaway for pet merchandise marketers is that pet parents consider their pets like family members, and a great way to appeal to them is to sell them something they'd think about buying for themselves, Puro says. 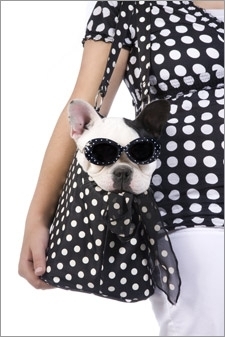 "Woman And Dog In Matching Outfit" photo from Shutterstock.